Carter universal marine electric fuel pumps operate using leaded and unleaded gasoline, gasohol, and fuel boosters. They have an internal pressure-regulating valve, and feature free-flow fuel delivery. Universal marine pumps have no points to burn out, and no shaft seals to leak or deteriorate. 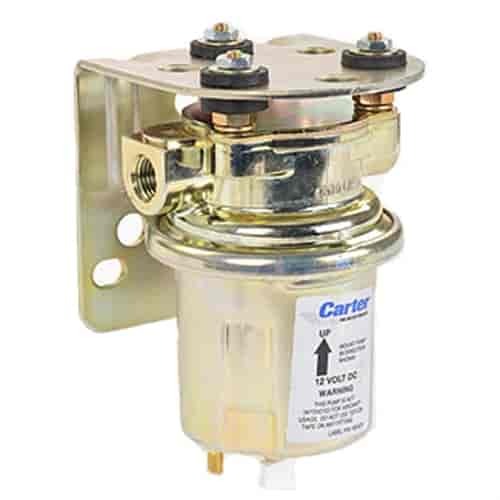 Carter universal marine electric fuel pumps are available for 12 or 24 volt marine systems. They are also easy to install with the included installation hardware and instructions. P4389 - Carter Universal Marine Electric Fuel Pumps is rated 4.7 out of 5 by 3. Yes, this should put out enough volume for a 440 six pack engine. You can always add a regulator. Can I use this for E85 fuel ? Yes, this will work with E85 fuel. If I use this pump to feed a mechanical pump will it stop vapor lock?. I live in Arizona, where it gets to 105 in a jiffy. This may help your vapor lock situation, you may try running the electric by itself. Yes, this can self prime and can lift 3 or 4 feet. How many amps does it draw. Does it have to be mounted below fuel level. It will be more efficient below the level of the tank, but will work even if above it. These pumps normally draw between 3-5 amps. You told me that the post are marked + and-, where? When I received the pump it came with two black wires. I can not find any markings on the pump that identify which electrical connection is positive. Does it mater or do I connect it up using my best guess? Yes it does matter. the posts are marked with a + and - symbols for proper connections.